Physiologic response to hypocalcemia. 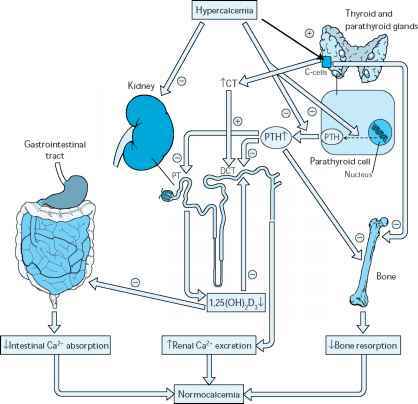 Hypocalcemia stimulates both parathyroid hormone (PTH) release and PTH synthesis. Both hypocalcemia and PTH increase the activity of the 1-a-hydroxylase enzyme in the proximal tubular (PT) cells of the nephron, which increases the synthesis of 1,25-dihy-droxy-vitamin D3 (1,25(OH)2D3). PTH increases bone resorption by osteoclasts. PTH and 1,25(OH)2D3 stimulate Ca reabsorption in the distal convoluted tubule (DCT). 1,25(OH)2D3 increases the fractional absorption of dietary Ca by the gastrointestinal (GI) tract. All these mechanisms aid in returning the serum Ca to normal levels . Causes of hypocalcemia (decrease in ionized plasma calcium). Physiologic response to hypercalcemia. Hypercalcemia directly inhibits both parathyroid hormone (PTH) release and synthesis. 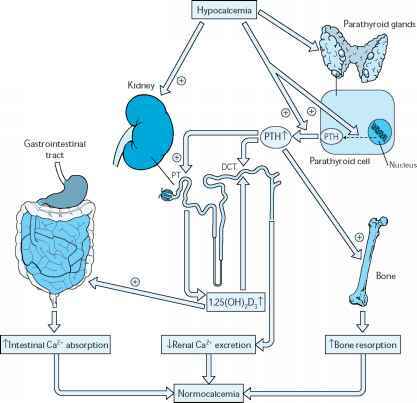 The decrease in PTH and hypercalcemia decrease the activity of the 1-a-hydroxylase enzyme located in the proximal tubular (PT) cells of the nephron, which in turn, decreases the synthesis of 1,25-dihydroxy-vitamin D3 (1,25(OH)2D3). Hypercalcemia stimulates the C cells in the thyroid gland to increase synthesis of calci-tonin (CT). Bone resorption by osteoclasts is blocked by the increased CT and decreased PTH. 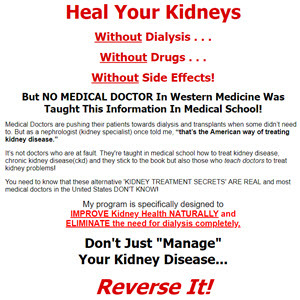 Decreased levels of PTH and 1,25(OH)2D3 inhibit Ca reabsorption in the distal convoluted tubules (DCT) of the nephrons and overwhelm the effects of CT, which augment Ca reabsorption in the medullary thick ascending limb leading to an increase in renal Ca excretion. The decrease in 1,25(OH)2D3 decreases gastrointestinal (GI) tract absorption of dietary Ca. All of these effects tend to return serum Ca to normal levels . CAUSES OF HYPERCALCEMIA Causes of hypercalcemia (increase in ionized plasma calcium). Therapy available for the treatment of hypercalcemia. *Always identify and treat the primary cause of hypercalcemia.